How are you are celebrating this year? And where are you giving thanks? I'm in the great state of Florida. Jacksonville to be precise, spending time with some of my extended family that I do not get to see nearly enough. I am sure we will be stuffing our faces, laughing our asses off, and maybe, just maybe, drinking some wine together. This year I am thankful for everything. My friends, family, husband, and health. 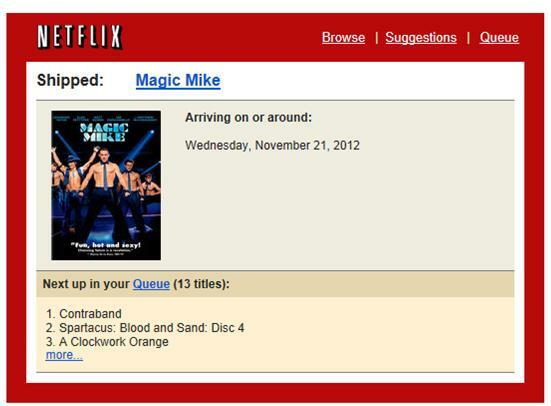 But mostly I'm thankful that I just received this email in my inbox and will get to watch this the day I return home. 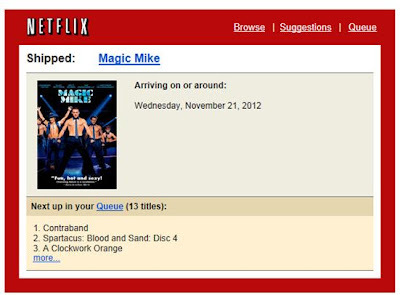 As you can see the next 3 movies in our queue belong to Grant. Our cinematic tastes are just slightly different. I want to come over and watch MM! I'll send Will over for the Clockwork Orange night. Hope you had a great Thanksgiving! I was dissapointed to discover that this movie was SO dumb. But there is enough shirtless gyrating to inspire me to watch it again and again...and again!